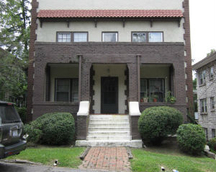 Historic Manor Inn Apartments, located at 265 Charlotte Street, Asheville, NC, with a management and leasing office on site in Suite #2, and features 35 units and two cottages, ranging from studios to three bedroom apartments. Park Place Offices, located at 70 Woodfin Place, features full service leases and with units ranging from one to seven rooms. Ample free parking surrounds the building and includes a Leslie and Associates management and leasing office on site in suite #WW4B. Glen Beale Apartments, located at 90 Beale Road, Arden, NC 28704, features 49 units with one and two bedroom apartments. Gracelyn Garden Apartments, located at 30 Clairmont Drive, Asheville, NC 28804, features 40 units with two and three bedroom units.